Living off the grid is a commitment to self-reliance and sustainability that requires planning and hard work. Whether you create your own electricity or go without, this lifestyle means that you sacrifice some modern conveniences. So what does this mean for parents engaged in off-the-grid parenting? Does this independent lifestyle present unique challenges for parents? To learn more, we asked some off-the-grid families to share their experiences and opinions. In the process, they offered some insight about how parenting might be different for those living independent from the power grid. Sarita Harbour and Dan Hosfeld moved to an off-the-grid lakeside home in Canada’s Northwest Territories in 2013. At the time, they were raising a toddler and had another daughter on the way. When selecting their new home, they took into consideration all of the their responsibilities as parents — including washing clothes, potty training and keeping their children cozy and warm. The Harbour-Hosfeld family decided that indoor plumbing was a must. They also wanted two sources of heat — wood and propane — as a precaution against northwest Canada’s fierce winters. The Harbour-Hosfeld family and many of their off-the-grid neighbors choose to homeschool their children rather than drive 40 minutes into town, where the school is located, on a sometimes dangerous road. For social interaction and to support each other, these families gather, usually on a weekly basis, for lessons and field trips. However, homeschooling isn’t right for every off-the-grid family. Harbour said that she knows several off-the-grid parents who choose to send their children to school rather than teach them at home. “Our decision depended on so many things,” said Harbour. Many off-the-grid families live in such remote locations that traveling to the nearest school every day isn’t a practical option. For some families, the choice hinges more on their beliefs about the benefits of public education versus at-home education. If you do decide to homeschool off the grid, one thing to consider is whether or not you have reliable internet, Sarita Harbour said. If you don’t, then you won’t be able to utilize online homeschooling programs, which will likely require parents to be more involved as teachers. Access to internet differs greatly depending on your location, Harbour said. One plus of homeschooling off the grid is that it presents many opportunities to teach children skills and knowledge that will help be more self-reliant, said Harbour, who has found ways to meld homesteading tasks and outdoor skills with the education of her children, Avangelena and Aurora, now ages 9 and 5. This hands-on, experiential learning has many benefits, she said, including its role in keeping her children safe. When you homeschool, those valuable skills can easily be worked into your lessons. Mark and Michelle Zeiger moved to an off-the-grid homestead in Alaska with their daughter, Aly, more than a decade ago, and they haven’t looked back. Their 10-acre property is right on the ocean and is only accessible by boat or a 1.25-mile hike through the woods from the nearest road. They write about their remote home on The Zeiger Family Homestead Blog. “We’re just so immersed in nature here, with the animals all around us and the water out front,” Mark Zeiger said. The fresh air, the lack of light pollution, their proximity to nature — all of these things, he believes, bolsters their physical health and wellbeing. The lifestyle also includes plenty of exercise in the form of stacking wood, tending the garden, hiking and paddling. They also eat well because they cook their own meals and choose to consume few processed foods. Another healthy component of their lifestyle is the amount of quality time they spend together as a family. Many people who live off the grid live in rural if not remote places, and this can present certain challenges for parents. When the Ziegers first moved off the grid, their daughter Aly was 13 years old, and this separation from friends was difficult for her. But over time, she grew accustomed to the distance and discovered ways that she could still spend time with friends. For example, a friend would sometimes stay with their family for multiple days during a school vacation. Another big challenge of off-the-grid parenting, if you live in a remote setting, is dealing with medical emergencies. Both Mark Zeiger and Sarita Harbour suggest parents take courses in first aid and CPR and specifically learn how to handle injuries and ailments common for children. Living off the grid in the Alaskan wilderness, first and foremost, has fostered a love of nature in his daughter, Mark Zeiger said. As a teenager, Aly used to explore their property with the guidebook “Nature of Southeast Alaska” in hand. Now that she’s in her 20s, she’s returned from college to live with her parents and plans to establish her own off-the-grid homestead surrounded by wilderness, which she’s grown to love. In addition, off-the-grid living has taught Aly how to be frugal and self-sufficient, as well as the importance of conserving energy. Prior to living off the grid, the Zeiger family lived in the suburbs of Juno, Alaska, and they’d often watch movies together on the weekends. When they moved off the grid, they quickly realized how much power it takes to run a television. At night, they could only watch movies if they’d generated enough wind (and later, solar) power that day. Fortunately, the entire family also enjoy reading. Similarly, Harbour said that her daughters have learned how to check the level on their house battery to determine whether or not they can turn on the TV or run the microwave. They’ve also learned the importance of recycling and composting as much as possible because transporting waste from their home to a dump site takes so much effort. 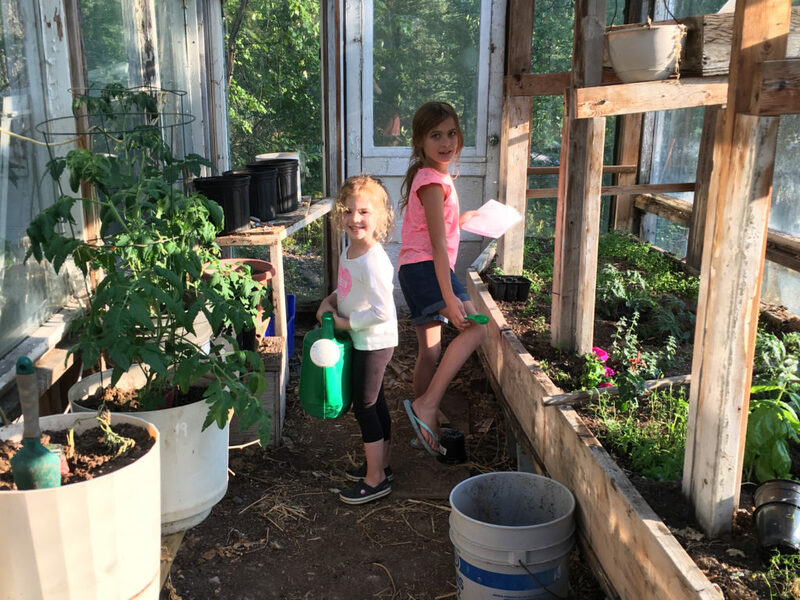 Her daughters also have a good understanding of where much of their food comes from — the garden. All in all, it’s safe to say that both Harbour and Mark Zeiger believe that there are more positive than negative things to say about raising children off the grid.